The cast of Piece of My Heart. BOTTOM LINE: A heartfelt mission to unearth the musical legacy of Bert Berns can’t overcome familiar jukebox musical clichés. Few people can say they haven’t danced to “Twist and Shout,” sang along with “I Want Candy,” or jammed out to “Piece of My Heart.” Yet while the Bert Berns songbook is nothing short of legendary, the Bert Berns name and story has been largely erased from musical history. The new musical Piece of My Heart, produced by Berns’ now-grown children Brett and Cassanda Berns with veteran producer Jack Thomas, shares the relatively unknown story of Berns’ rise to fame and explores his family’s struggles long after his death. At the center of the musical is Jessie Berns (Leslie Kritzer), a 30 year-old struggling singer-songwriter who gets a mysterious call to go to New York City to resolve an urgent matter about her father, songwriter and music producer Bert Berns, who died when she was less than a month old. Upon arriving at her father's abandoned office in New York, she meets Wazzel (Joseph Siravo), Bert's old friend and former manager, and through Wazzel's enlightening, sensitive, and brutally honest stories about Bert's life, Jessie learns about her father's true past for the first time. She also discovers that her mother, Ilene (Linda Hart), has been manipulating the truth and is secretly planning to sell Berns' song catalog for a large wad of cash, and that in order to stop the sale, she needs to act fast. Through flashbacks we meet Bert Berns, played with verve and versatility by Zak Resnick. In Berns' story, he spends most of his time with Young Wazzel (Bryan Fenkart), and his singer best friend Hoagy (Derrick Baskin), and has a short-lived but passionate romance with an African-American woman named Candace (De'Adre Aziza), and other promiscuous flames before marrying and having children with a young Ilene (Teal Wicks). The musical chronicles his journey from struggling nightclub performer to hit songwriter and successful music producer and record label owner, and reveals Bert's incredible accomplishments, dangerous downfalls, and the insecurities and pressures faced by a man whose heart problems guaranteed a lifetime of uphill battles against a fast-ticking clock. The Berns song catalog makes for a toe-tapping score of lovable melodies including his iconic "Twist and Shout," "I Want Candy," "Hang on Sloopy," and other everlasting hits. These musical moments are the highlights of the show, with high-energy choreography by Denis Jones, who also directs. The cast, made up of well-regarded Broadway veterans, is polished and delivers the highest quality performances one could hope for on stage. However, the scenes between these numbers, in Daniel Goldfarb's clunky book, don't manage to retain the magic held in Berns' music. Bert Berns' staged journey heavy-handedly and unsubtly fulfills all the biographical jukebox musical cliches -- youthful idealism, struggles with alcohol, unrequited love, a betrayed best friend, and the sacrifices and painful choices that come from reaching the top and still wanting more. Even more problematic is the anchoring storyline that follows his daughter, Jessie, on her own path to self-discovery as her father's past comes to light. There are obvious personal roots to this story, which became even clearer in the after-show talk-back, but as a dramatic mechanism it falls flat and feels disingenuous. The character of Ilene is written almost cartoonishly villainous throughout most of the show, a one-dimensional character who cares about money over her children and deceased husband’s memory. Yet during the talk-back, Brett and Cassandra revealed that in real life, Ilene successfully took over Bert's company and produced music herself for many years after becoming a single mother and widow at age 24 in the 1960s. This fascinating story is never remotely mentioned or even alluded to in the musical, which makes you wonder how much of the content was catered to personal family baggage instead of telling the most compelling and multi-dimensional story. The musical has a clear thesis, and its point is driven all the way home: Bert Berns wanted the world to know his name, and his children have dedicated themselves to make that dream come true -- that is the story that is told onstage, and the real-life story that led to the show's creation. 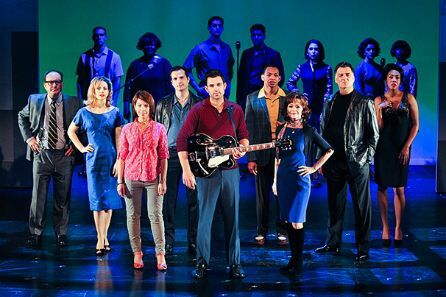 While the show doesn't triumph over the noise of other jukebox musicals, it succeeds at genuinely carving out Bert Berns' fame in musical history to a generation of theater-goers who may have otherwise never heard his name. Despite its flaws, there is a sense of justice in finally giving a platform to the man behind the music.